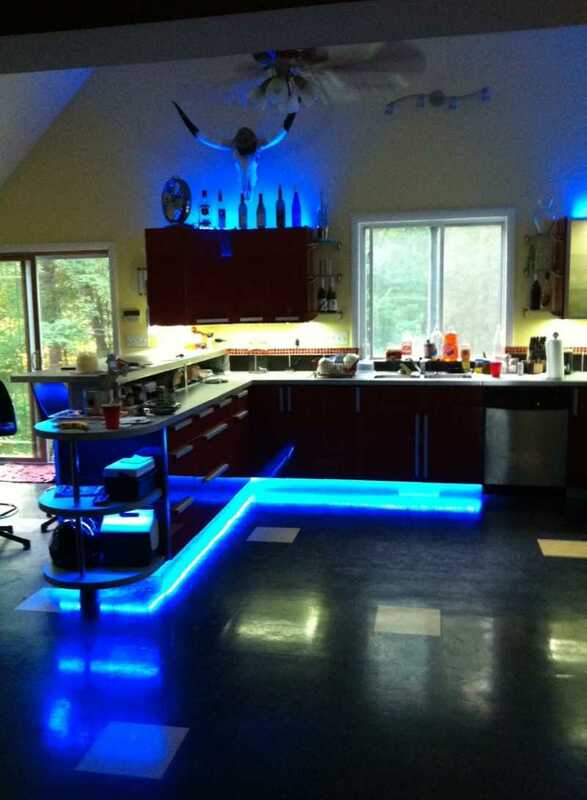 Want to add a bit of visual spark to accompany your stereo system? 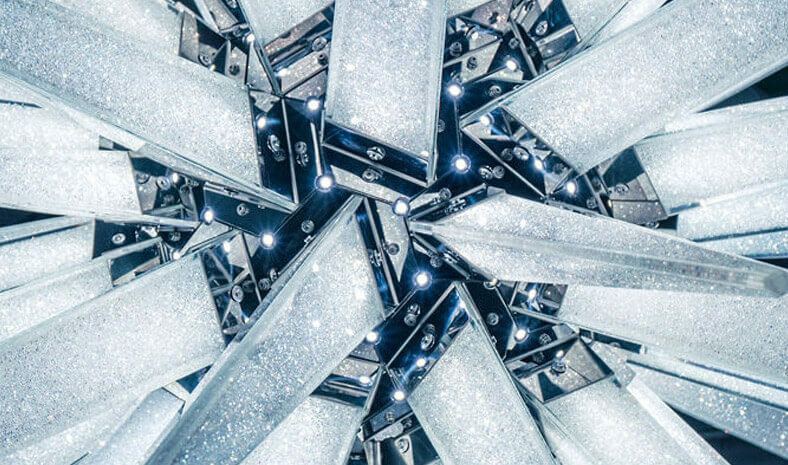 Want to make your LEDs beat/flash/strobe/react/dance to music? 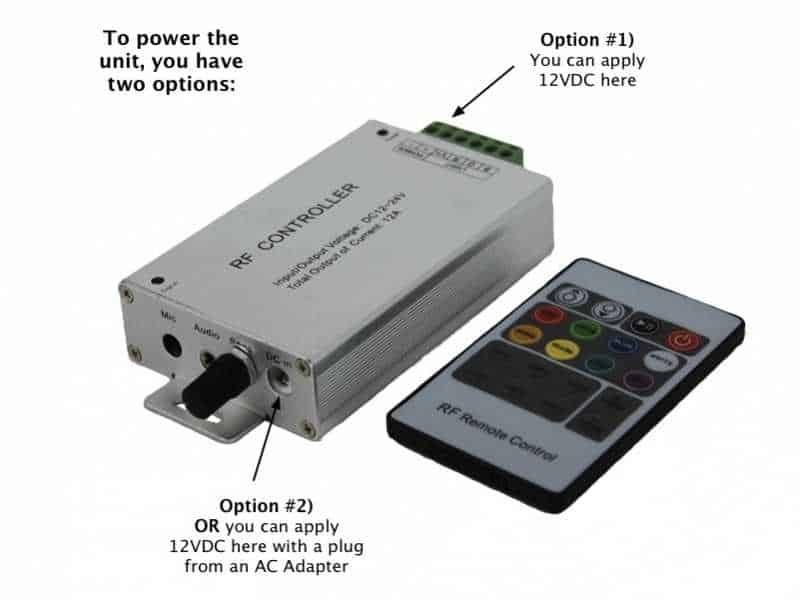 Simply drop this LED controller between your 12 volt power source and LEDs. 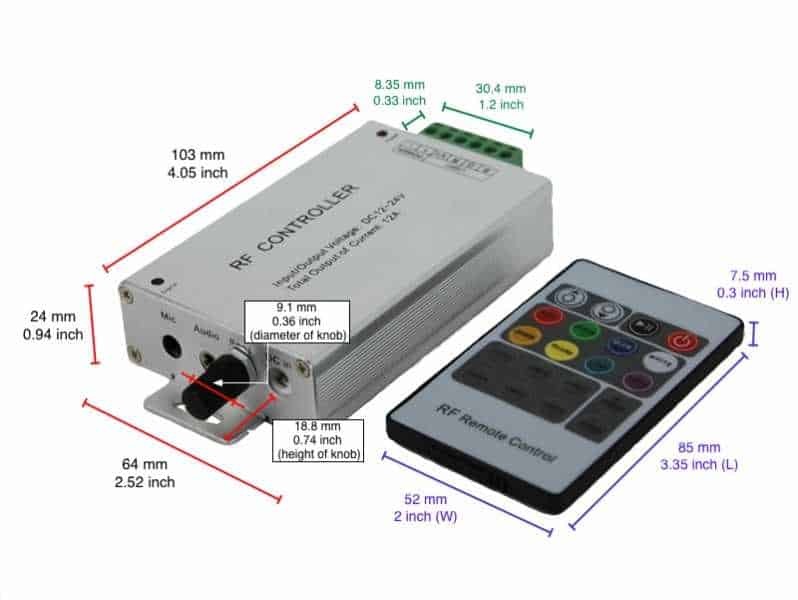 You won't be disappointed with this professional grade LED controller. 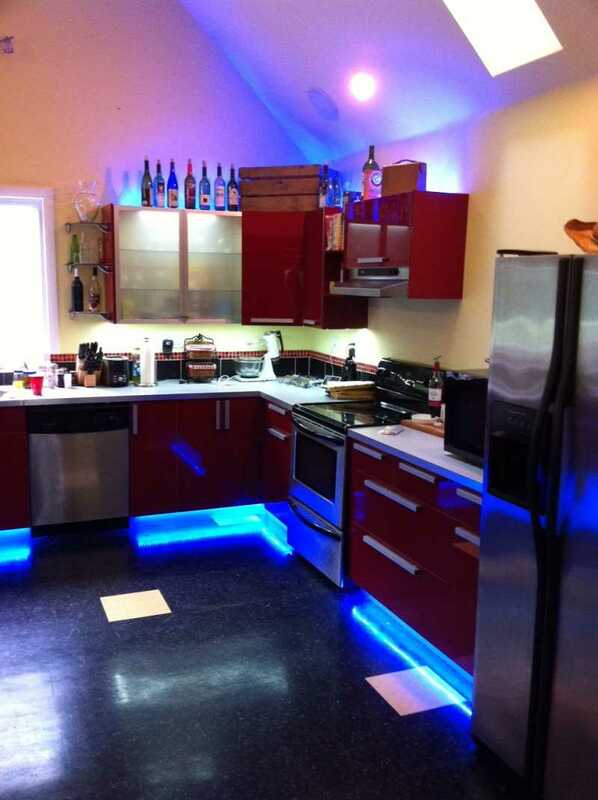 Kick it up a notch and make your LEDs dance to the beat like a boss. Remote range? About 30 to 40 feet, depending on control box mounting location. 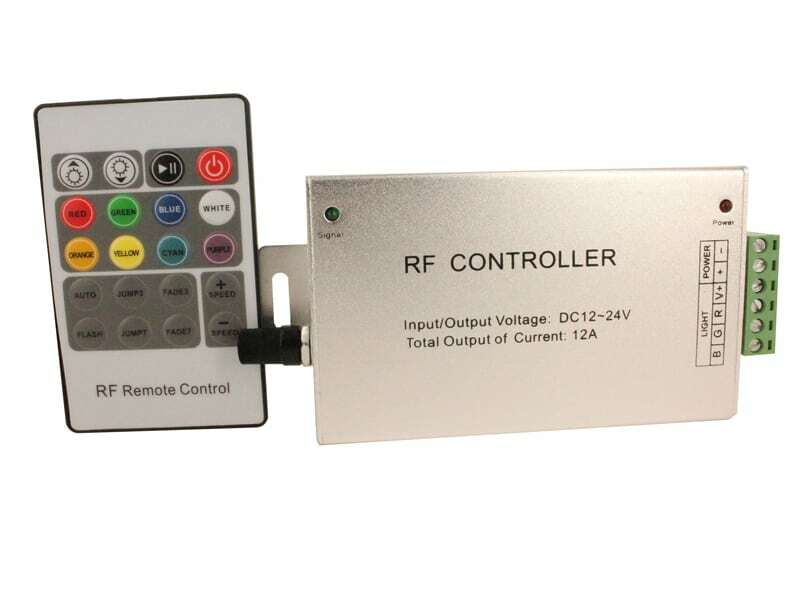 Remote type? 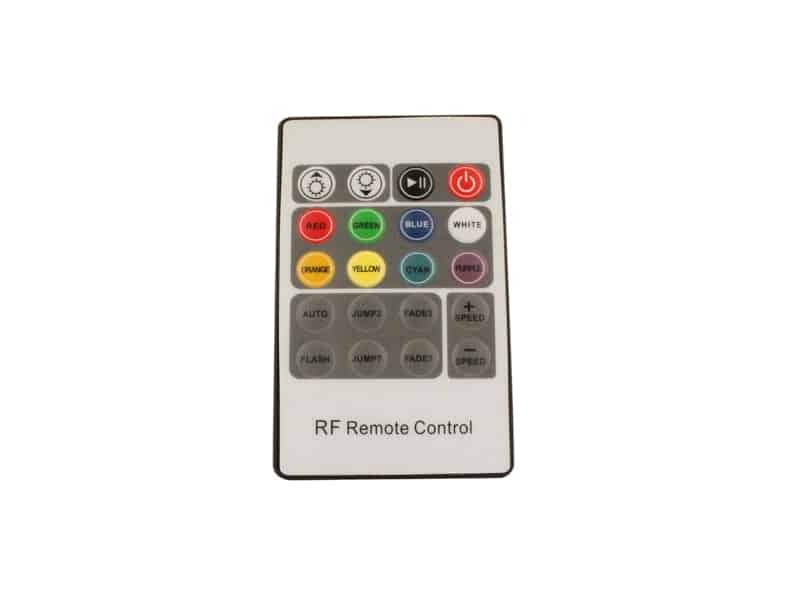 It comes with a thin Radio Frequency (RF) remote, meaning you don't have to point it in any direction like you would with an infrared remote. 1. It can of course drive any common positive RGB light source. 2. 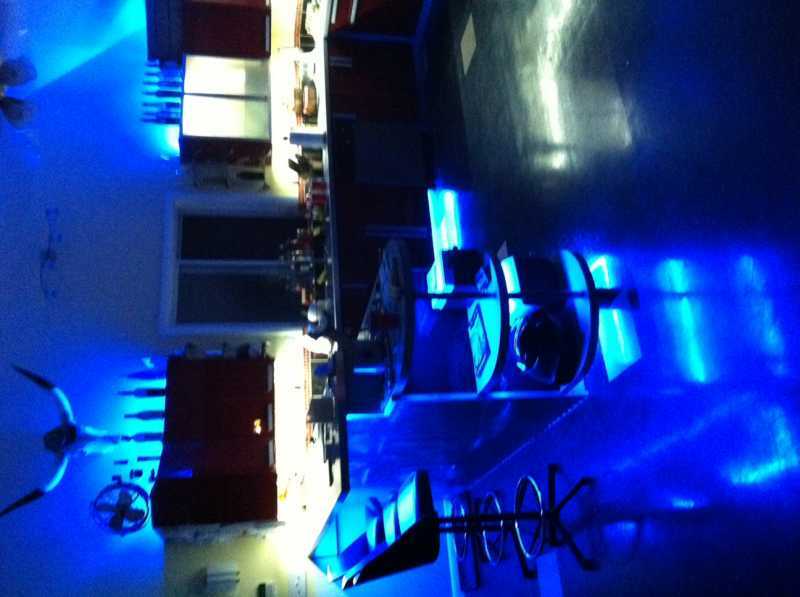 If you just have single color LEDs, no problem, it can easily control those too. How? 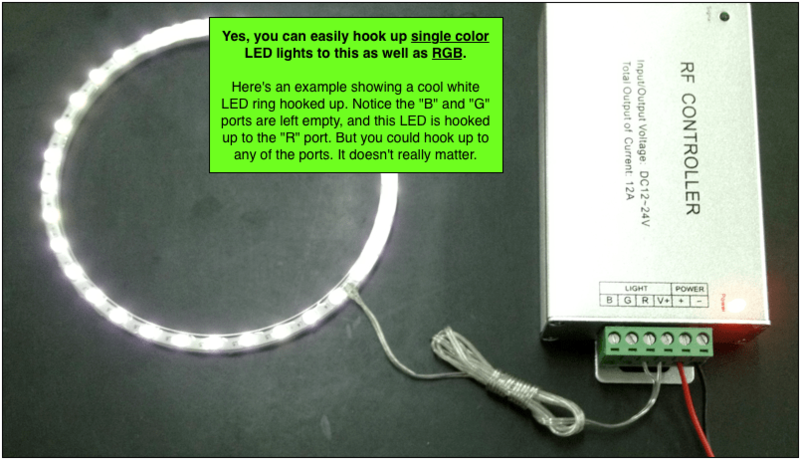 Here's an example photo showing how it could be wired to a single color LED. Or a quick video explaining how it could be wired. 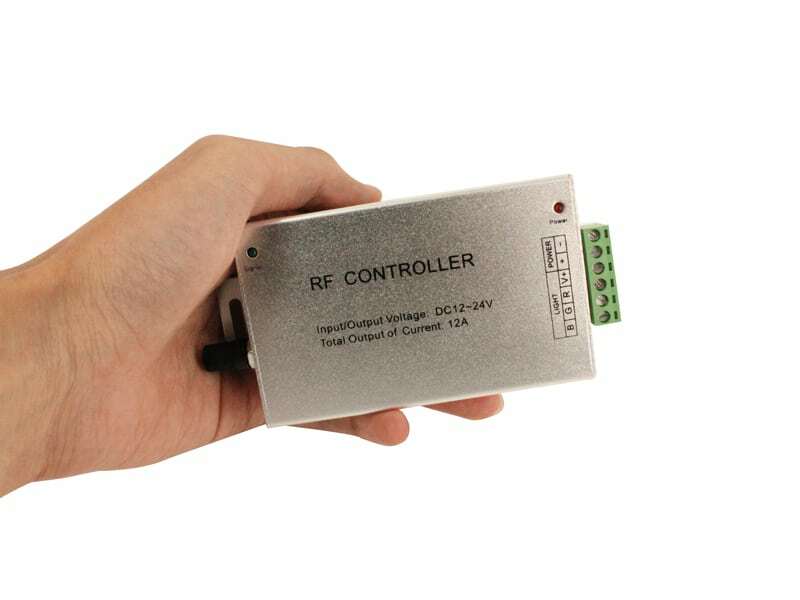 This controller picks up the audio either from the controller's built-in microphone, or the auxiliary input jack. 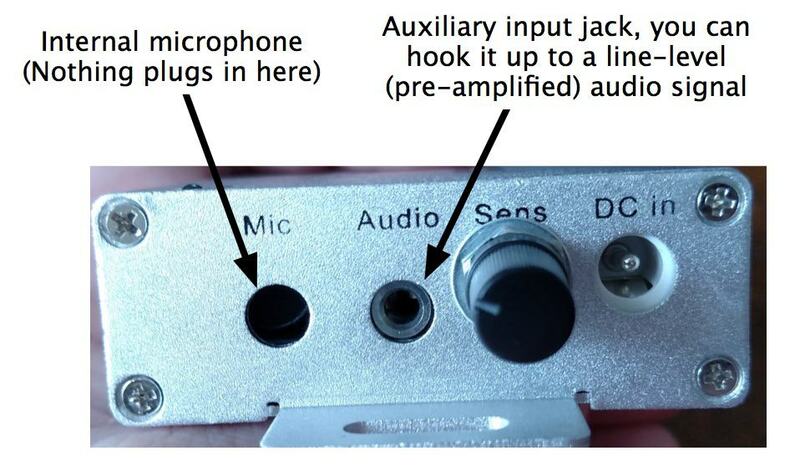 If you use the auxiliary input jack, you should hook it up to the line-level (pre-amplified) audio signal. Or just stick with the built-in mic. Did the remote run away from you and you can't find it? Well just in case, get your spare remote here. 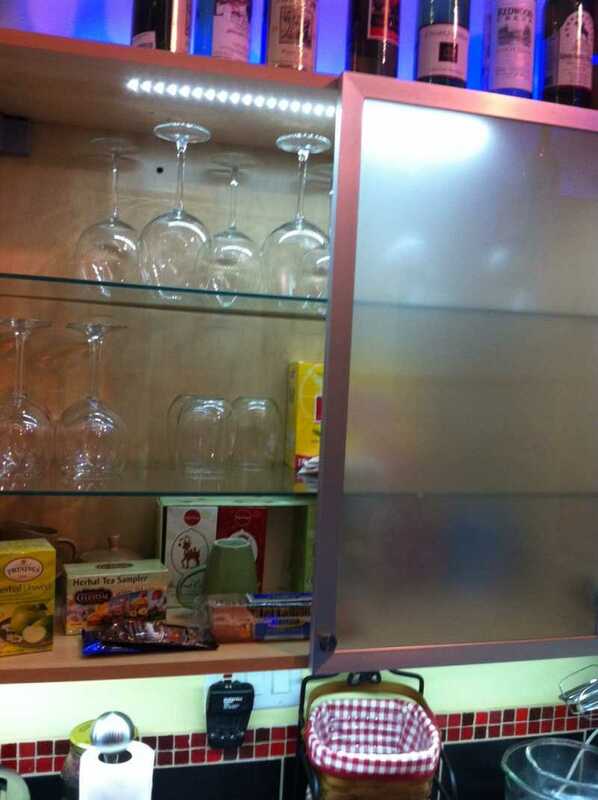 Our customers have asked 82 questions about this product. This music beat LED controller is the best. Mine are 5 years old and still going. I have 2 under my seat of my motor cycle. When playing my MP3, one controller works my right speaker and the other works my left speaker. That's called stereo ! Talking about a light show with the music playing. WON a few LED motorcycle shows ! So Qznium keep it up your products are great. With the proper crossover this beat modulator rocks. I have it hooked up to several red, blue and green LEDs and it works perfectly. I bought this controller to add some drama to my dance party. Most of the functions work as expected, but the "auto" mode (where the unit reacts to music) isn't as reactive as I would like. When the controller hears music, it puts the strip in a rapid flash mode. It just kind of goes crazy, bright, and fast. It continues this way until the music stops. There really isn't any variance in the pattern while the music plays, so it isn't much of a show and becomes annoying in a short time. I don't see that there is any control over what it does in auto mode...you can't slow it down or dim it (it runs at full brightness in auto mode). If the remote had a button for "hyper strobe jump mode" this is it, but it's labeled AUTO. I had expected that while music was playing it would maybe cycle between colors, dim with soft passages, burst bright with the bass beat, intensify with volume, etc, ...or at least generally give some sort of output that would let the viewer know the lights are tied to the music, but instead it just goes frantic until the music stops. That pause between tracks is your only clue the unit is listening to music. I got my best result using the built-in mic and putting the controller far away from the sound source. I set the music volume where it was going to be for the party, and started walking away with the unit until I found a distance where the controller would hit the lights when the bass was thumping. (for me, this was about 30 feet!...imagine the sound in the restroom at the club) You loose all reaction to treble at this distance and the lights may not even be on in quiet sections of your songs but at least it pulses the lights with the bass. Once I had the placement of the controller figured out, I made an extension back to where I wanted the lights with a length of telephone cord. I don't see that the sensitivity knob does much, and only fine adjusts the mic input and doesn't work at all with a line input. I can't imagine this in a car. I installed this unit for a friend around his outdoor kitchen. He was having a party that evening. It looks awesome. Everyone loved it. Great product. I personally have ICELED UFO kit and there is a music mode on the kit. Well, I just found a new toy to use on my car for music mode. This thing is incredible! 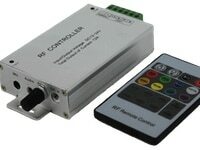 The features of this are extremely nice and the controller is easy to use. In my opinion, what makes the controller for me is again that music or 'auto' mode where it goes crazy. If you want a moving rave in your car... you JUST found it. Long search is finally done. Thank you OZNIUM!